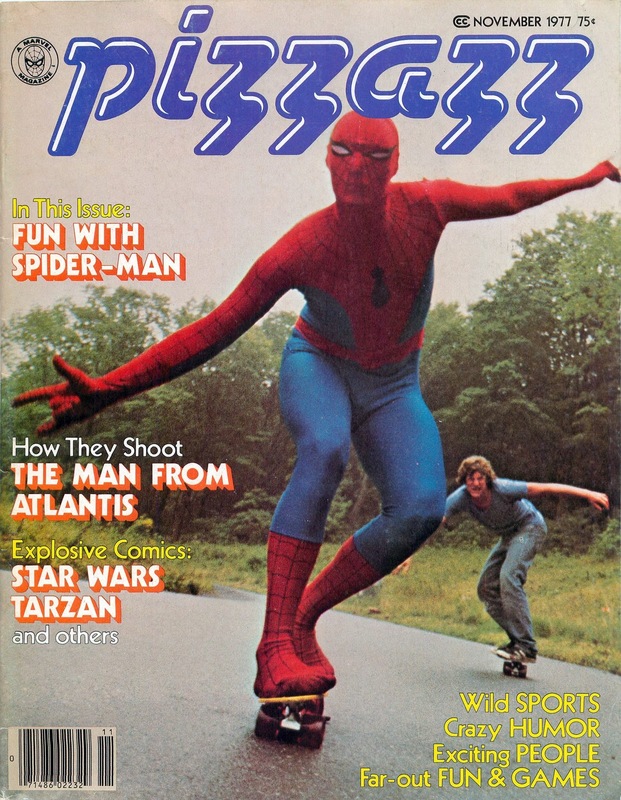 STARLOGGED - GEEK MEDIA AGAIN: SPIDER-MAN ON A SKATEBOARD!?! That's not, as you might expect, a scene from Spidey's cheesy live-action TV show. It's a specially posed cover, using one of Marvel's costumes created for personal appearances, for newly-minted teen mag PIZZAZZ. Other attractions in this second issue were TV reviews (SPACE ACADEMY - described, improbably, as "big budget"), book review, music reviews (The Bay City Rollers - "predictable but tasty pastry"), a problem page (Write Wendy), Marvel-themed puzzles and games, gag strips (I Hate Walt Disney), articles aplenty (How to get your parents to do what you want: a guide to childhood survival, On the set with The Man From Atlantis and Sports Extra) and hilarious seventies adverts (Win a part in Happy Days! Runners-up prizes included hair dryers and an electric manicure gizmo). Of most interest to Marvel connoisseurs will be the STAR WARS (uncredited) and YOUNG TARZAN (W: David Kraft. A: John Buscema & Ernie Chan) strips. The former (clocking in at three colour pages) uses the 'extra' deadline-buster strips created for Marvel UK's STAR WARS WEEKLY (but published in black and white). Despite Dark Horse reissuing Marvel's entire 107 issue US run twice (and reprinting some issues more times than that), these UK/ PIZZAZZ strips are always overlooked, making them amongst the rarest (along with the Marvel UK-created strips of the early 1980s) of the Star Wars back catalogue. More on these strips in future entries. PIZZAZZ MAGAZINE ran for 16 issues, the last cover-dated January 1979 (and just wait until you see who the cover star of the final issue was!). Its sudden cancellation left the Star Wars strip (Showdown, the seventh instalment of the Kingdom of Ice storyline, by Archie Goodwin, Dave Cockrum and John Tartaglione) on an icy cliffhanger. The full 27-page story, including the missing final chapter, did appear in the UK's STAR WARS WEEKLY 57-60 and in the hard-to-find 1981 US paperback MARVEL ILLUSTRATED BOOKS STAR WARS 1.